The very first Abarth 595 based on the Fiat 500 was introduced at the 1963 Turin Motor Show so 2013 marks the 50th anniversary of the debut of the Abarth brand. To celebrate, the Abarth division has designed the 595 50th Anniversary Edition that has a unique look and performance tuning to just about every aspect of the vehicle to make this high performance subcompact truly special. The Fiat Abarth 595 50th Anniversary Edition version starts on the outside where the 595 is fitted with a slick matte white paint, red stripes and old school style logos. A set of package specific painted silver 17 inch aluminum wheels with red stripes wrapped high performance tires help to complete the exterior package that features the super aggressive body bits of the Abarth 595 package. On the inside, the 50th Anniversary Edition Abarth 595 wears red leather bucket seats with white trim that fit beautifully into the black and red trimmed cabin complete with a race inspired steering wheel – all of which is heavily clad in leather. The Abarth 595 50th Anniversary Edition package also boasts significant improvements where it really counts as the 1.4L turbocharged 4-cylinder engine has been tuned to offer 180 horsepower – 20 more than the standard Abarth 595 with help from a "Record Monza" variable back pressure "dual mode" exhaust system. Unlike the American sold Fiat Abarth 500, the European Abarth 595 is available with the Abarth Competizione robotized manual gearbox (read: automatic) that is controlled by a set of steering wheel mounted paddle shifters. This package also includes a specially tuned suspension setup and a huge braking package that includes 12 inch rotors under Brembo multi-piston calipers and high friction pads. The Fiat Abarth 595 50th Anniversary officially goes on sales on September 15th – exactly 50 years to the day that the first Abarth-tuned Fiat 500 was introduced. Only 299 examples of this special edition Abarth 595 will be sold and sadly for American Abarth lovers like myself, this higher performance 595 is not based on the same Fiat 500 that is sold here in the US. 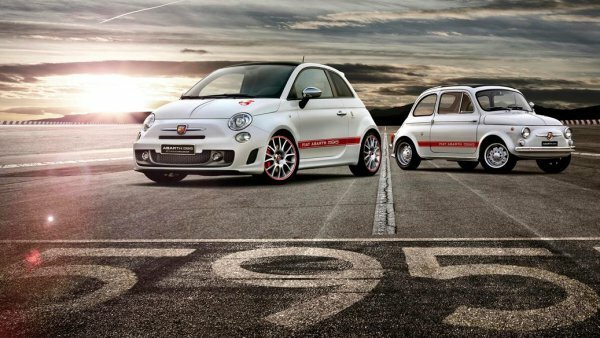 The Fiat 500 and Abarth 595 sold in Europe look similar to the Fiat 500 sold in the United States but they are different enough that it isn’t just a matter of shipping a handful of the 50th Anniversary Abarth coupes over to US soil. With any luck, the folks from Fiat will show some love to American Abarth lovers and offer some kind of tribute model in the US with the performance goodies…if nothing else. In addition to the 299 examples of the Fiat Abarth 595 50th Anniversary Edition package, the Italian automaker will feature a special marketing campaign through digital, television and social media channels. The 50th Anniversary Edition Abarth will make its public debut next week at the 2013 Frankfurt Motor Show.